Honda has participated in the annual Rose Parade for the past 53 years and returns this year as the presenting sponsor for the fourth time running. But it's not satisfied merely putting its name on the event; Honda intends to lead from the front with what promises to be the longest float in the parade's long history. The float, previewed in the rendering above, will measure 274 feet long, as tall as 30 feet high, as wide as 18 feet and weighing a whopping 50 tons with 8,980 flowers covering its surface. The train will be led by a locomotive designed to mimic the Acura NSX, with Asimo at the wheel. The second car in the train showcases a Honda engine, followed by a robotic arm, and, for the first time in the parade's history, a pair of 30-foot LED monitors displaying images of spectators lining the parade route. A caboose inspired by theHonda Jet will pick up the rear. Oh, and in case you're wondering just who Honda will be knocking off the record books with its 274-foot train of roses, that would be... also Honda. The Japanese company set the record in 2005 with a 207-foot float. Scope out the details in the press release below and click the image above to view in high resolution. Honda will lead the 125th annual Tournament of Roses Parade with the "Keeping Dreams on Track" historic-meets-futuristic train-themed float, powered by a specially-configured Honda hybrid engine. The premier float of the 2014 Rose Parade, will measure an unprecedented 274 feet in length, and is set to break the record as the longest Rose Parade float, currently held by Honda's 2005 Rose Parade float entry (207 feet). 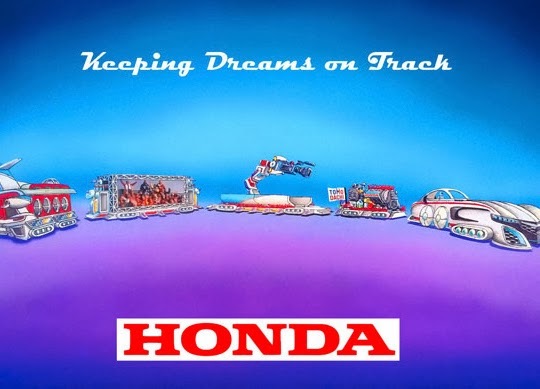 The float's design embodies Honda's "Follow Your Dreams" spirit – looking into the future where all things are possible by following your dreams – while also fulfilling the dreams of parade spectators. Entering into Honda's 53rd year collaborating with the Tournament of Roses and fourth consecutive year as presenting sponsor, with this year's float Honda will celebrate a very special new partnership with the TOMODACHI Initiative – the TOMODACHI-Honda Cultural Exchange Program, designed to create friendship and understanding between Japanese and American youth. The TOMODACHI Initiative is a public-private partnership that was born out of U.S. support for Japan's recovery from the Great East Japan Earthquake in 2011. The initiative invests in the next generation of Japanese and American leaders through educational and cultural exchanges as well as entrepreneurship and leadership programs. Two students from the TOMODACHI program will precede the Honda float, carrying the Parade's presenting sponsor banner. "Keeping Dreams on Track is an embodiment of Honda's deeply rooted philosophy, The Power of Dreams, as well as Honda's passion toward following those dreams to guide and inspire us to make a difference," said Stephan Morikawa, assistant vice president of American Honda Corporate Community Relations. "Honda has many exciting efforts coming in 2014, and the Rose Parade marks our first opportunity to provide a sneak peek at some of these innovative Honda technologies and important new partnerships, while wishing everyone watching the Rose Parade a very happy New Year and joyous holiday season." Those watching the Rose Parade on Wednesday, January 1, 2014 will experience the record-breaking 274 foot-long float, showcasing a combination of creativity, imagination and inspiration. The float – measuring 30 feet tall at its highest point, 18 feet wide at the widest, and weighing in at 50 tons – features five "train" cars that share Honda's ambitious dreams for the future, all set to an exclusive soundtrack, "Of Friendships & Dreams," composed by six-time GRAMMY-winning songwriter and music producer, Daniel Ho. An Acura NSX sports car-inspired "locomotive" car, driven by ASIMO, the world's most advanced humanoid robot, leads the train. The second train car is a Honda engine, representing the company's long-term commitment to fuel-efficient mobility. The third train car is built to represent Honda's task-performing robotic arm, a derivative of Honda's ASIMO robotic technology, and will carry students from the TOMODACHI cultural exchange program. The fourth train car fulfills the dreams of spectators along the Rose Parade route who have always wished to ride on a float by bringing them onboard virtually. It features two large LED video monitors measuring 30-feet wide and 10-feet tall, the first in the Rose Parade's history. Images of parade-goers along the route will be projected onto the screens, enabling them the opportunity to virtually "ride" on the float. The train's caboose is inspired by HondaJet, the world's most advanced light jet. Honda's float will be propelled by a specially configured Honda hybrid low-emission engine to help the float function more efficiently and reduce its carbon footprint. "Keeping Dreams on Track" will feature approximately 8,980 total flowers – almost double the amount of flowers from the previous year – to garnish the record-setting length of the new float, including 5,900 roses, 2,500 carnations and 580 gerberas. A variety of flowers, plants and seeds will be used, including hot pink, red and light lavender roses, pink and hot pink carnations, red gerberas, among many others. All of these natural materials will later be ground up for mulch after the conclusion of the parade activities. This year's Rose Parade marks an important milestone for the Honda brand, as it serves to establish the newly formed TOMODACHI-Honda Cultural Exchange Program. The three-year initiative, first announced on December 13, was developed to support education and U.S.-Japan efforts to develop future generations with an experiential learning program of Music as a Universal language. Honda first collaborated with the Tournament of Roses in 1961 to provide two-wheeled vehicles and generators for 1962 Parade operations. Honda has been a float participant in the Rose Parade since 1977 and has provided the vehicles for official Tournament of Roses transportation since 1994. Honda continues to supply two-wheeled vehicles used by white-suited Tournament volunteers, side-by-side (multi-utility) vehicles for Parade operations, the official Pace and Sound vehicles that lead the parade, as well as Honda Pilots and Odyssey minivans for the Tournament Queen and her court. As presenting sponsor of the parade, Honda's float will lead the parade, but it will not compete during the judging process. Prior to becoming presenting sponsor in 2011, Honda floats won awards in 15 of the previous 16 years. The Pasadena Tournament of Roses is a volunteer organization that annually hosts the Rose Parade® presented by Honda, the Rose Bowl Game® presented by VIZIO and a variety of associated events. The Tournament's 935 volunteer members act as ambassadors of the organization within the community and serve on one of 31 committees that ensure the success of the parade and game. Collectively, they contribute upwards of 80,000 hours of manpower each year. The 125th Rose Parade presented by Honda, themed "Dreams Come True," will take place Wednesday, Jan. 1, 2014, followed by the 100th Rose Bowl Game presented by VIZIO. On Jan. 6, 2014, the Tournament also will host the 2014 VIZIO BCS National Championship at the Rose Bowl Stadium. For additional information on the Tournament of Roses please visit the official website at www.tournamentofroses.com. For those of you that weren’t aware, the 2014 North American International Auto Show goes down next month in the Motor City, and we here at Pacific Honda are extremely excited about this because it was recently announced that this show would be the forum for the debut of the all-new 2015 Honda Fit. The major focus on automobiles these days tends to be on things like technology and safety features, in large part because that’s where a good number of the biggest changes are happening right now in the automotive world. But let’s not forget what makes the car industry go, literally. 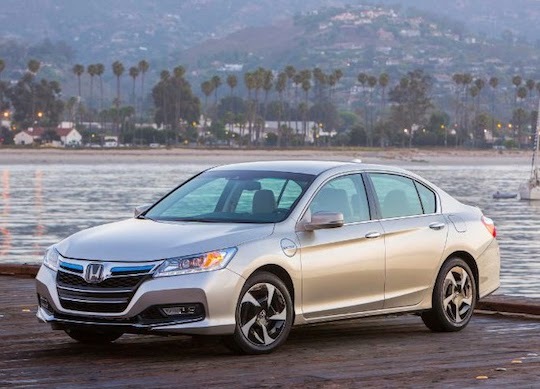 It’s the engines, and according to Ward Automotive’s 10 Best Engines list for the 2014 model year, the 3.5-liter V6 engine under the hood of the 2014 Honda Accord is one of the best in the industry. 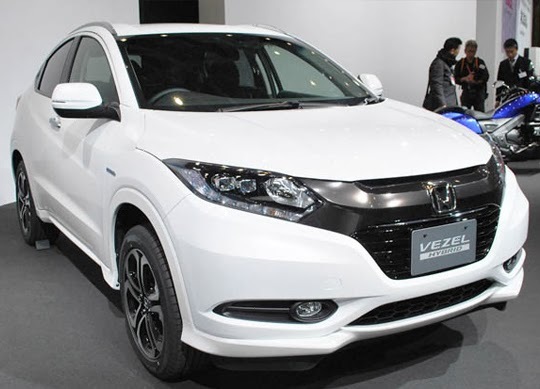 In Japan the Vezel is being offered with a 1.5-liter four-cylinder engine, with or without electric assist. Honda won't offer the hybrid version here – at least not initially – but it is preparing to offer a turbo option. Although it has yet to announce US specifications and options, the 1.5-liter turbo four (also unveiled at the Tokyo show) is considered a stronger likelihood than the 1.0- or 2.0-liter versions. We've got one more debut confirmed for next month's Detroit Auto Show, as Honda has announced that it will be showing off the 2015 Fit in the Motor City. 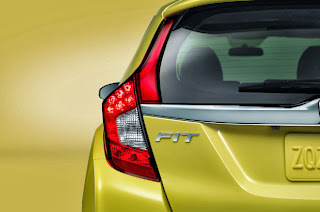 Honda has released a singular image of the new Fit's rear taillight, above. From the sole image, we can see that the American-spec Fit will share at least its taillights with the Japanese variant, which we've helpfully included an image of to the right. Now, technically, the blue car to the right is the Fit Hybrid, a car we aren't expecting to see in the US market. But the gallery of images we've included below should give those interested in the car a very good idea of what the new Fit will look like when it hits the auto show stage next month. 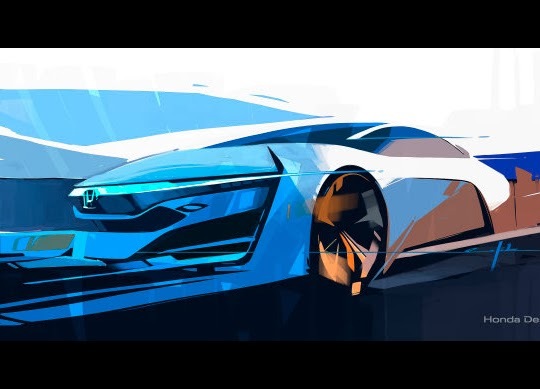 As for what will be under hood when it debuts in January, Honda is touting its Earth Dreams Technology engine, which we take to mean some sort of four-cylinder, gas-powered mill. Expect excellent fuel economy from the new car, and according to the Japanese brand, "leading-edge connected car technologies." 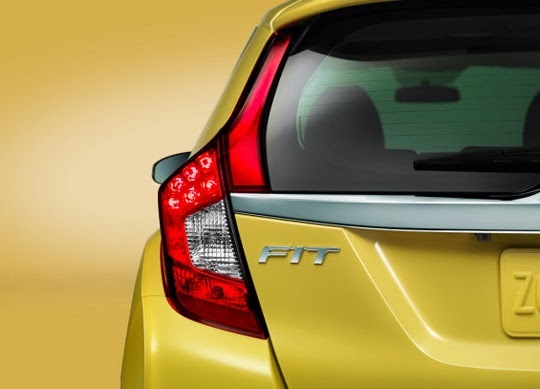 Expect the full raft of details on the new Fit when it makes its official debut at the 2014 North American International Auto Show on January 13. For now, scroll down to read Honda's press release. 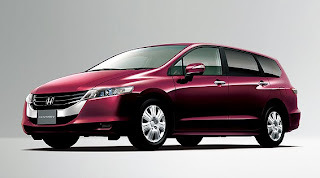 TORRANCE, Calif. – Dec. 19, 2013 – Honda will take the wraps off the all-new 2015 Fit at the 2014 North American International Auto Show in Detroit on January 13. Honda will showcase significant advancements designed to further extend Fit's status as the benchmark vehicle in the subcompact-car class. The 2015 Fit builds on the current model's innovative packaging, flexible cargo capability and fun-to-drive character with spirited new styling, an even more spacious and refined interior packed with leading-edge connected car technologies. The third generation Fit is set to offer enhanced fuel-efficiency and performance courtesy of its all-new platform and Earth Dreams Technology powertrain. Equipped with the Honda-exclusive next-generation Advanced Compatibility Engineering™ (ACE™) body structure, the new Fit is also anticipated to earn class-leading safety ratings. John Mendel, executive vice president of automobile sales for American Honda Motor Co., Inc., will introduce the 2015 Fit at the company's press conference, which also will be broadcast live via webcast at http://hondanews.com/live/2014naias-honda (link will be live Jan. 13). Named a Car and Driver '10-Best' vehicle every model year since its introduction to the U.S. market for 2007, the Fit remains one of the best-selling Honda vehicles globally, with cumulative worldwide sales of 4.87 million units1. The Fit is manufactured at ten locations around the world and sold in 123 countries. The new U.S.-market Fit will be produced for the first time in North America at an all-new plant in in Celaya, Mexico. 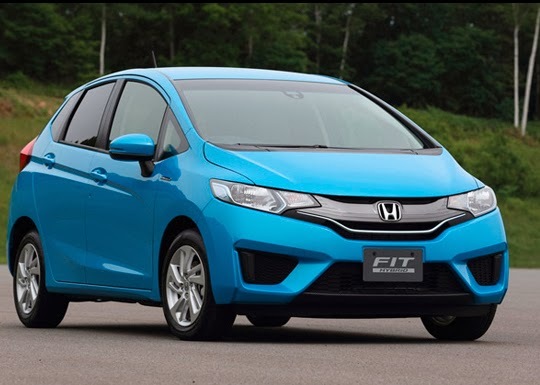 Customers interested in learning more about 2015 Fit are encouraged to visit http://automobiles.honda.com/2015-fit/, where they can sign-up to receive more information on the new model. 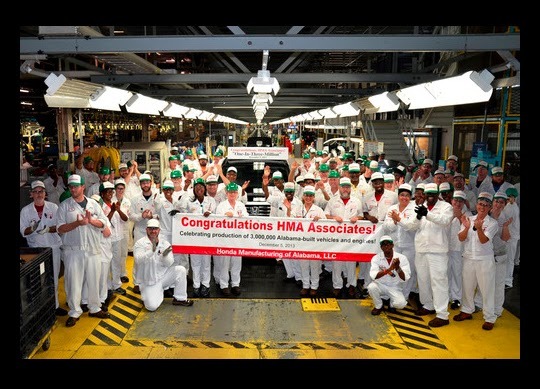 Associates at Honda Manufacturing of Alabama, LLC (HMA) celebrated a production milestone this week, completing the 3 millionth Honda vehicle built at the plant in Lincoln. The production of HMA's milestone vehicle this week comes a little more than 12 years since the start of mass production at the $2 billion facility on Nov. 14, 2001. "The commitment and dedication of our 4,000 associates has allowed HMA to achieve this production milestone and fulfill our commitment to more than 3 million Honda customers across the globe," said Tom Shoupe, HMA President. HMA is the sole production source of the Odyssey minivan, the Pilot sport utility vehicle, the Ridgeline pickup truck, the Acura MDX luxury sport utility vehicle and the V-6 engines that power each vehicle. 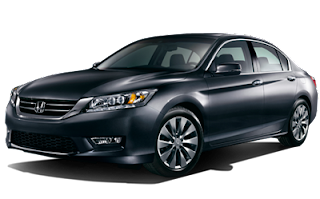 During calendar years 2009 and 2010, the facility also shared production of the Honda Accord V-6 Sedan with Honda of America Mfg. in Marysville, Ohio. Honda Manufacturing of Alabama employs more than 4,000 associates at its 3.7-million-square-foot Lincoln facility and has the capacity to produce as many as 340,000 vehicles and engines each year. Over the past two years, HMA has invested an additional $450 million and added more than 400 jobs in expansion efforts designed to enhance manufacturing flexibility and increase annual production. Honda marked another major manufacturing milestone this week (Dec. 2) when its East Liberty Auto Plant in Ohio produced its 1 millionth CR-V sport utility vehicle. Auto production at the East Liberty plant, which employs 2,400 associates, began in 1989 and produced its first, third-generation Honda CR-V sport utility in September 2006. Honda began automobile production in the U.S. in 1982. It now operates 14 major manufacturing facilities in North America, producing a wide range of Honda and Acura automobiles, automobile engines and transmissions, Honda all-terrain vehicles, and power equipment products such as lawn mowers, mini-tillers and general purpose engines, using domestic and globally sourced parts. Seven Honda auto plants in the North American region, including four in the U.S., have the capacity to produce 1.63 million automobiles each year. In 2012, 90 percent of the Honda and Acura automobiles sold in the U.S. were produced in North America. This will increase to 1.92 million vehicles per year in 2014, when the sales percentage of locally produced automobiles is expected to rise to more than 95 percent. Over half of Americans with cell phones have made the leap to smartphones, which, when combined with a brand new Honda vehicle like the recently-released 2014 Honda Civic, has made life a heck of a lot easier (and safer) than it was just a few years ago. Honda is joining a pre-existing vehicle-to-grid (V2G) demonstration project involving the University of Delaware and NRG Energy. 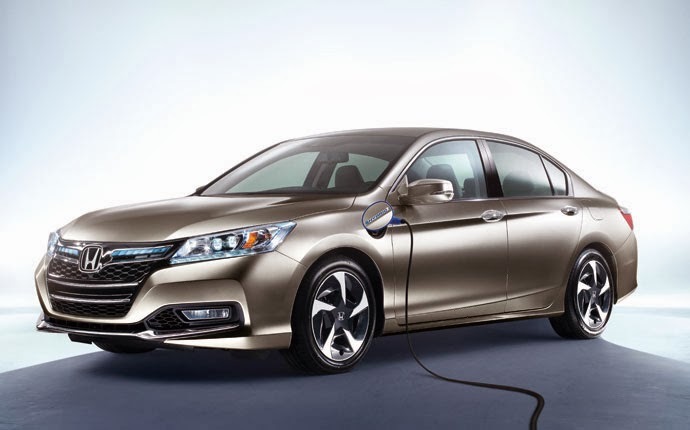 Honda will use one of its Accord Plug-in Hybrid models as a back-up grid-power source when conventional power supply drops and demand surges. NRG Energy started funding its testing system with the university earlier this year. 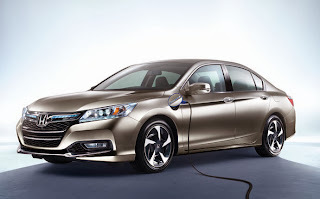 In order to participate, Honda is installing a bi-directional on-board charger in the Accord PHEV. The test is part of a broader effort by automakers and other entities to explore how plug-in vehicles can help regulate the grid something that will become more common as renewable energy sources become more common. Nissan has been running similar demonstration with its all-electric Leaf. Recently, Nissan tested its "Vehicle-To-Building" system in Japan, which involved a half-dozen Leaf vehicles powering an office building during peak demand, then having the cars re-juiced when electricity costs go down. In 2011, Nissan also started getting results from its "Leaf-to-Home" system, which uses the EV to power a house during blackouts. Check out Honda's press release below. TORRANCE, Calif., Dec. 5, 2013 /PRNewswire/ -- Honda has joined a demonstration project for experimental vehicle-to-grid (V2G) technology aimed at providing a potentially valuable energy storage resource to the nation's electrical grid while providing for more cost-effective ownership of plug-in electric vehicles. The Honda technology builds off of the research conducted by the University of Delaware and now supported by NRG Energy, Inc. NRG and the University of Delaware, through their eV2g joint venture, came online early in 2013 with the world's first revenue-generating vehicle-to-grid project, demonstrating the controls, regulatory requirements, and market participation rules for selling energy storage from vehicles into the PJM Interconnection Regulation Market. Honda is supplying an Accord Plug-In Hybrid with added V2G capabilities to the University's Science, Technology and Advanced Research (STAR) Campus to jointly investigate the potential of this technology to benefit the electrical grid, vehicle owners and society. Using smart grid technology, the V2G system is able to monitor the status of the grid to determine whether the grid requires additional power sources that can respond rapidly, or the grid requires power demands that can absorb transitional power supply. Such a system has the potential to reduce or eliminate the fluctuation of the grid, which can occur more frequently when renewable energy sources are introduced to the grid. Electric vehicle owners potentially benefit from supporting a more stable power grid, which can lead to reduced utility costs for the vehicle owner. 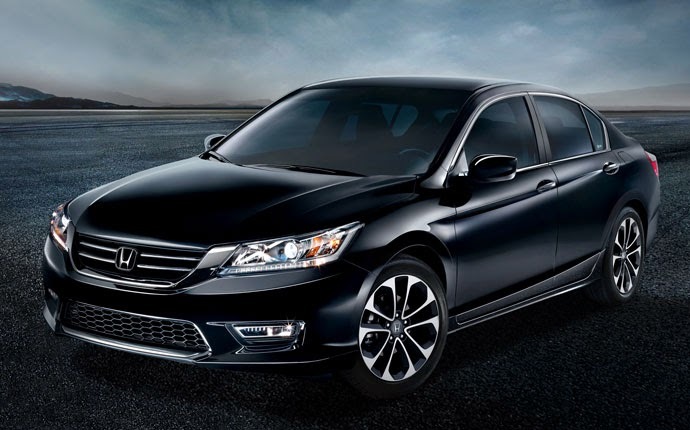 The Honda Accord Plug-In Hybrid demonstration vehicle is equipped with a bi-directional on-board charger, which allows the vehicle propulsion battery to both charge from and discharge to the electrical grid. With an additional communication device, the vehicle receives signals from a grid operator via a charging station, and controls charge and discharge in accordance with the signals. When electric power is requested by the grid, the vehicle will discharge power from its battery. When the grid power supply exceeds demand, the vehicle proactively charges its battery. About Honda Honda is a leader in the development of leading-edge technologies to improve fuel efficiency and reduce CO2 emissions. Honda has led the Union of Concerned Scientists (UCS) rankings of overall vehicle environmental performance since 2000, and a Honda vehicle has topped the list of America's greenest vehicles from the American Council for an Energy-Efficient Economy (ACEEE) for eleven out of the past twelve years. In 2006, Honda became the first automaker to announce voluntary CO2 emissions reduction targets for its global fleet of automobile, power sports and power equipment products and its global network of manufacturing plants. In 2011, the company set a new CO2 emission reduction targets for 2020, including a 30% reduction in CO2 emissions from its products compared with 2000 levels. Forget advertising, incentives and, yes, even our excellently crafted vehicle reviews, sometimes the best way for automakers to sell cars is still good ol' fashioned word of mouth. In an attempt to measure this "word of mouth" power, The Boston Consulting Group, a management consulting firm, has created a new study called the Brand Advocacy Index (BAI). The index takes a look at how various industries perform from person to person. Those industries include automotive, smartphones, grocery, mobile telecommunications and banking. The study polled more than 32,000 individuals across Europe and in the US to come up with the top 55 brands in these various industries. On the automotive side of things, the top brands in the US were Honda, Hyundai and Kia, all tied at 63 percent. On a global scale, Volkswagen and Toyota scored the highest with a 65-percent BAI rating (both in France). The average BAI for auto industry players tallied 50 percent. As for companies in other industries, Apple's iPhone was the index's top-rated smartphone, Trader Joe's was the highest recommended grocery store, Virgin was sat atop the mobile telecom industry and USAA was the top retail bank. Scroll down for the full press release on the new study. BOSTON, December 2, 2013-The Boston Consulting Group (BCG) announces today the launch of the Brand Advocacy Index (BAI), a strategic metric that measures word-of-mouth recommendations with much greater precision than existing approaches. Unlike competing measures, BAI displays a strong correlation with top-line growth and helps identify concrete actions for improving what is known as "brand advocacy." A new report from BCG estimates that brands with high levels of advocacy-the most recommended brands-significantly outperform heavily criticized companies. For the sample of brands studied, we found the average difference between the top-line growth of the highest- and lowest-scoring brands was 27 percentage points. The report, titled Fueling Growth Through Word of Mouth: Introducing the Brand Advocacy Index, is being released today. Smart marketers have long understood that word-of-mouth recommendations from consumers have greater impact on sales than any other source of information. And it's not just that positive buzz moves the financial needle forward. 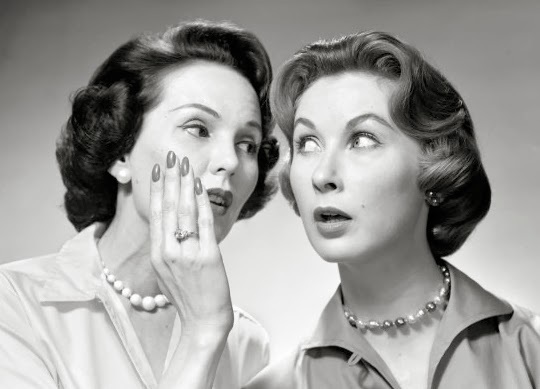 Negative word of mouth from brand critics can push results in the opposite direction. Despite the relevance of brand advocacy, companies have struggled to measure it in the marketplace, demonstrate its top-line impact, and develop tactics that improve word of mouth. BCG has created BAI to address these gaps. BAI displays a strong correlation with top-line growth-81 percent, or double that of other measures of customer promotion. It also reveals the relative influence of both customers and noncustomers in driving recommendations, as well as the rational and emotional factors that motivate both groups to recommend a brand. "Although the level of advocacy varies widely by industry and country, we have not found a single category in which advocacy is irrelevant," says Pedro Esquivias, a BCG partner and coauthor of the report. "BAI opens a window onto the precise mechanisms for measuring and managing brand advocacy, allowing any brand to harness these insights to fuel growth." BAI shines a spotlight on the companies that have achieved the pinnacle of word-of-mouth recommendations. To understand where companies stand, we surveyed more than 32,000 consumers in France, Germany, Spain, the U.K., and the U.S. The results reveal the brands that respondents recommended the most, selected from five diverse product categories in these countries. Only 55 brands have earned a place on our new list. (See the exhibit below.) Each brand achieved its position by being in the top three brands in its respective product category and country. "Consumers are positively recommending the most recommended brands to their friends, family, and coworkers-often spontaneously and even when they are not customers of the brand," said Steve Knox, a BCG senior advisor and coauthor of the report. "Their strong financial results show the power of advocacy to drive top-line growth." Noncustomers can be particularly influential in certain industries, such as those in which consumers purchase products and services infrequently or in which only a small number of consumers purchase. The luxury automobile industry is an example: even though relatively few people own luxury autos, a large number of people feel entitled to share their opinions about the leading brands. In the report, authors Pedro Esquivias, Steve Knox, Victor Sánchez-Rodríguez, and Jody Visser explore how BAI can guide brands, identifying and prioritizing critical areas of brand strategy and customer experience as part of a larger effort of brand-centric transformation. For areas in which the brand is weak, BAI can help prioritize actions with the highest potential to transform the business and drive advocacy. For areas in which the brand is strong, BAI can help build on specific brand advantages to drive advocacy. BAI can also help companies focus on the right segments. In addition to guiding brand transformation, BAI offers unique insights into broader issues of, for example, operations, customer service, and loyalty programs that could be improved with a better understanding of the specific brand attributes that customers value. In an environment of constrained resources, some smart companies are planning to add advocacy to their traditional marketing mix. These forward-looking organizations want to build long-term relationships, not just Facebook "likes" and buzz. BAI offers brands an efficient way to measure this vital leading indicator, simultaneously maximizing scarce resources and driving growth. For companies ahead of the curve, our approach to measuring advocacy confers a significant advantage. For those relatively rare brands that can build an emotional connection with consumers in advance of the competition, that competitive position can be difficult to dislodge. 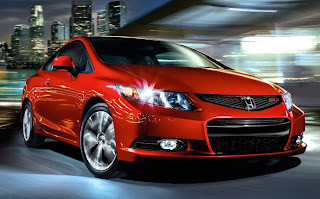 Frequent visitors to our blog know that we love to post when Honda vehicles are mentioned on all sorts of different lists lauding them for being exceptionally efficient or technologically advanced or even just plain ol’ attractive. But few lists are as straightforward as the one that looks at the best-selling automobiles of the year, and we here at Pacific Honda were very excited to see that three of 2013’s best-selling cars are vehicles that we currently sell. 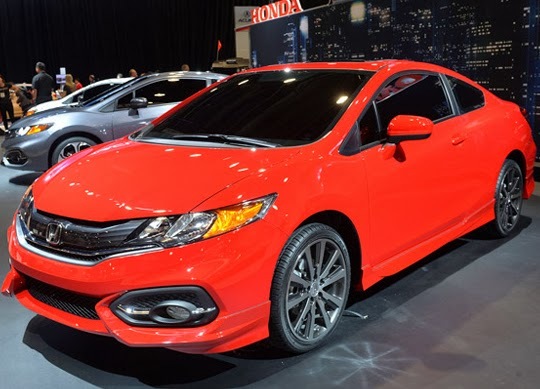 For the third consecutive model year, Honda has given its Civic lineup some substantial improvements, and with the 2014 Civic Coupe and Sedan going on sale this week, the automaker has released pricing and fuel economy numbers for its gas and non-Si models. Honda has not released any images of the 2014 Civic Sedan yet, but we got our first look at the updated Coupe last month at SEMA. Aside from styling changes introduced on the 2013 Sedan being carried over to the 2014 Coupe, the biggest update to all 2014 Civics might be the addition of the continuously variable transmission (CVT). Fuel economy figures carry over for cars with the manual transmission, but models swapping the previous five-speed automatic for the new CVT are seeing a boost in city fuel economy by 2 mpg helping the Civic max out at 31 mpg city for the fuel-miser HF trim level. In terms of pricing, the 2014 Civic is getting a modest price hike of $225 for the base LX models, which now start at $18,190* for the Coupe and $18,390* for the Sedan (*not including $790 for destination charges). The sedan-only HF trim level is up $175, there's a $275 price increase for the EX and EX-L Coupe and EX Sedan models and an extra $475 has been tacked on to the EX-L Sedan. Still no word when Honda will drop more info on the Civic Si, Hybrid and CNG models, but the full press release for the LX, EX and HF models is posted below. 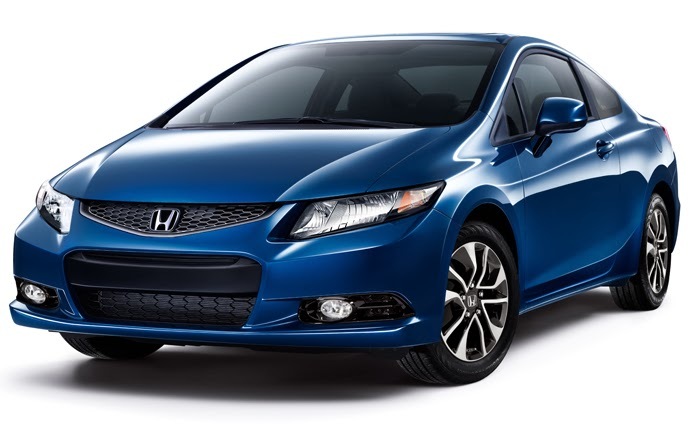 The significantly enhanced 2014 Honda Civic goes on-sale today with a manufacturer's suggested retail price (MSRP) starting at $18,1901 for the Civic LX Coupe and $18,3901 for the Civic LX Sedan. Extensive fresh and dynamic exterior styling updates on the Civic Coupe and premium interior refinements to all models further enhance the Civic aesthetic appeal. New available features on the 2014 Civic include the 7-inch capacitive touch-screen Display Audio, LaneWatch™ blind spot monitor and Smart Entry with Push Button start. The 2014 Civic also marks the introduction of the HondaLink™ Next Generation connected-car technology. HondaLink™ is an application-based platform that allows a seamless integration between a user's smartphone and the car, providing access to online and cloud-based content and information. An all-new CVT is available on the gasoline only powered Coupe and Sedan. The CVT enhances responsiveness by providing quicker and smoother acceleration and due to its wider ratio range and reduced internal friction, the CVT helped the LX Coupe and LX and EX Sedans to an improvement of 2 mpg city and 1 mpg combined for EPA fuel economy ratings of 30/39/33 city/highway/combined2. The Civic Coupe is available in LX and EX trims with a 5-speed manual transmission or the new CVT and EX-L and EX-L Navi versions with CVT. The Civic Sedan comes in LX 5-speed manual or CVT and EX, EX-L and EX-L Navi with CVT. A Civic Sedan HF with CVT is also available. View, build and price at 2014 Honda Civic at automobiles.honda.com/civic. Consumer information is available at automobiles.honda.com/civic. To join the Civic community on Facebook, visit https://www.facebook.com/Honda/Civic. 1MSRP (Manufacturer's Suggested Retail Price) excluding tax, license, registration, $790 destination charge and options. Dealer prices may vary. 2Based on 2014 EPA mileage ratings. Use for comparison purposes only. Your actual mileage will vary depending driving conditions, how the vehicle is driven and maintained, battery pack age/condition and other factors. With a name like Earth Dreams, you'd be forgiven for assuming that Honda's new family of turbocharged VTEC engines is more about environmental credentials than performance. And to a large degree they are – particularly in 1.0- and 1.5-liter forms. But the 2.0 is another beast altogether. 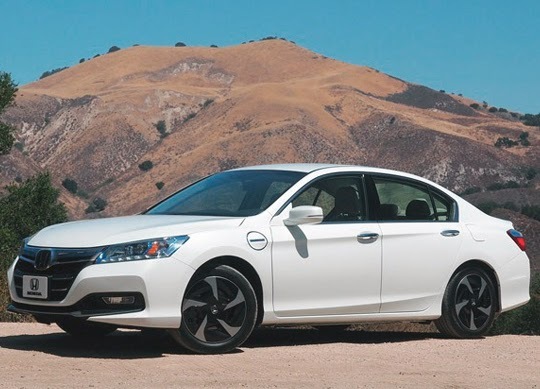 Thanks to a high-output turbocharger, direct injection, a high-performance cooling system and, of course, variable valve timing, Honda's new 2.0-liter four produces upwards of 280 horsepower while still complying with upcoming Euro 6 emissions standards. Although actual output has yet to be confirmed, that preliminary figure already compares favorably with the Ford Focus ST (252 hp) and Mazdaspeed3 (274 hp) and rests comfortably in between the Volkswagen GTI (217 hp) and Golf R (296 hp). For demonstration and testing purposes, Honda shoehorned the smaller 1.5-liter turbo four and 1.0-liter turbo three-cylinder engines into an Acura ILX and another Civic hatchback, but the home it gave the 2.0 betrays more than an engine swap. What you see here is essentially the next Civic Type R, following a long line of Honda hot hatches. With this latest model, the Japanese automaker is targeting the front-drive lap record at the Nürburgring that belongs to the Renaultsport Megane Trophy and before that, to the lightweight Megane R26.R. A tall order, to be sure, so we headed to Honda's R&D center in Tochigi, Japan, to take it out for a ride. 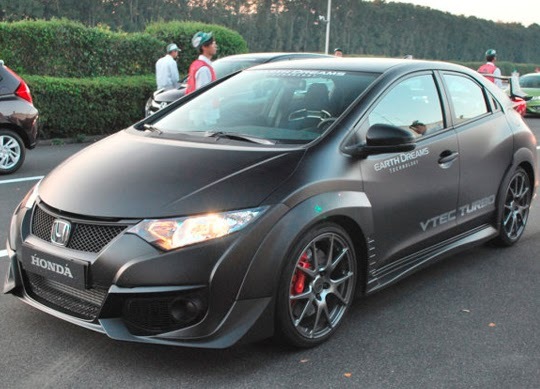 Walking around this Type R prototype, you can immediately tell this is no ordinary Civic – even with the concealing matte black treatment and taped-up elements. It's got prominent beefed-up wheel arches, a big rear wing and a rear diffusor from which quadruple exhaust tips protrude – something you don't see on any of the aforementioned rivals short of the Golf R. Lightweight alloys do little to hide the cross-drilled brake discs with bright-red Brembo calipers. Step inside and you'll find bucket seats deeply bolstered and clad in Alcantara, with a thick-rimmed steering wheel right in your chest. Pulling out of the paddock and onto the access lane to the banked track, the Type R responds instantly to a floored accelerator. Although Honda has made no mention so far, the absence of any discernible lag makes us wonder if it hasn't fitted a variable-geometry turbocharger or if the Tochigi engineers had managed to tune the turbo and VTEC to work in concert to eliminate the lag. Nor was there much torque steer evident as we sped down the narrow lane, prompting similar questions over whether Honda is using a differential – either mechanical or electronic – to keep the beast on the straight and narrow. These and other questions will, of course, be answered with time, which isn't something the Type R seems to take a lot of to reach a rather brisk pace. Racing onto the banked track, our car was limited to 200 kilometers per hour (124 miles per hour), a speed to which it pulled with authority. The limiter cut in when there was still plenty of accelerator travel to go and a sixth gear we never had a chance to grab. We couldn't help but wonder what she'd do derestricted, but for this early drive, we were forbidden from using the most steeply banked lane at the top of the track anyway. Just the same, the car tracked smooth and solid through the sweeping turns, and whatever that lesser car was that pulled out onto the inside lane of the track as we passed the pit exit grew in our windshield and shrank in the rearview mirror like it was stationary. Honda has clearly left few greasy bits unchanged in the Type R from the standard five-door Civic hatch on which it's based. Everything about it feels tight: the weighted steering, the firm pedal feedback and the taut suspension that only stiffened at the touch of the red Type R button next to the steering wheel. Unfortunately, our two laps were up in tellingly short time, but we were left impressed by a solid hot hatch in the making that just might stand a chance of knocking Renault off its perch at the top of the Nordschleife leaderboards. We look forward to seeing it try, but more than that, we're hoping that Honda finally gifts North American consumers with this most forbidden bit of fruit.